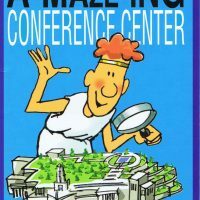 A fun book for children (and those who love them) as Norman the Nephite, from the book I Spy A Nephite, continues his adventures exploring the LDS Conference Center and almost not getting lost — thanks to a couple of gull-ible friends. Featuring GIANT, ‘fold-out’ pages full of visual puzzles and mazes and searches for Norman and many other characters and items of interest. BUY IT HERE — direct from us — through PayPal for the INTERNET SPECIAL PRICE of $6.95 + $2.95 shipping and handling + Maine Sales Tax. It will ship from our offices and you will have your copy(ies) within two weeks. If you are a bookstore or other reseller and wish to carry this title, or special order a copy for a special customer, contact us directly with full return policy and standard trade discounts by email. A direct order will get you listed as an Official Reseller on this page.